NEED A TRUE PIZZA RESTAURANT POINT OF SALE? 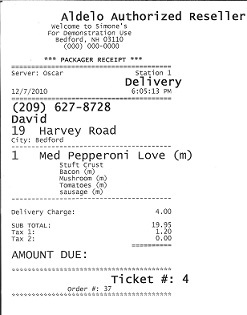 Print Kitchen Order, Packager Receipt, Pizza Box Label for EVERY ORDER! Your Drivers will know exactly What Items go with What Order. No more fumbling around and best of all - No WRONG Order Deliveries! Caller ID function is directly integrated into Aldelo for Restaurants allowing you to see who is calling and look at previous orders they may have made. It can simplify, shorten and help to personalize the Call-in Order process by allowing your Cashier to simply ask: "What you like the Large Cheese Pizza and Drinks you ordered last time Mr. Jones?" Available in 2 Line or 4 Line models as an additional Hardware feature. Please note that Caller ID must be enabled by your phone company in order to work. Blocked numbers and Cell phone numbers do not show. MICROSOFT MAPPOINT is directly integrated into the Driver Delivery screens and Dispatch. Your Driver can choose to view his delivery route and even optimize way points for 'faster' On-Time Delivery. MapPoint from Microsoft does require a separate purchase and must be installed on the same system that is running the Delivery orders. 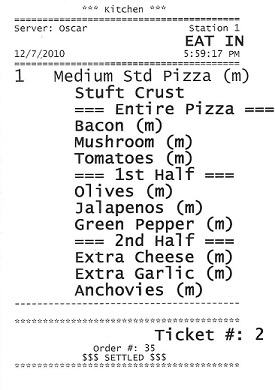 Zebra - the leader in Label and Bar code Printers allows you to print individual 'box labels' for your pizza, subs and other items - either for delivery or pick-up. You can be certain that the customer is getting the items they requested. Grow your business faster, take more orders and compete with the larger chains on their own turf! Complete Web Order integration is no longer a wish, it is now a reality. On-line orders are seamlessly taken from a secure web page that we build and integrates directly inside your existing web site for fast, convenient, prepaid orders that quickly add to your bottom line of profitability. Industry averages show that a typical Web based order is 40% greater than a Call-in order. Why? They customer sees your entire Menu on-line and takes their time to order exactly what they want without feeling rushed or hurried by a busy telephone Cashier. There is a minimal one-time set-up charge and small monthly service. All Orders are securely sent directly to your Kitchen Printer, Prepaid and ready for preparation and delivery/pick-up. 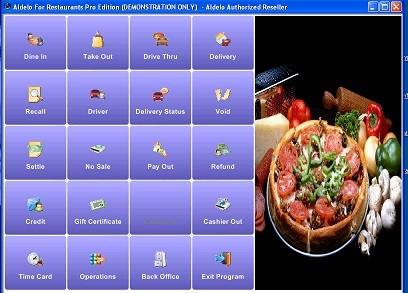 Aldelo Systems has helped thousands of PIZZA Restaurants manage their store operations more effectively over the years. Aldelo for Restaurants is equipped with features that are great to use for small to large restaurants and franchises. You can turn the features on as your business expands, you can have it all for a very affordable price. Aldelo works for every restaurant type. Small form factor Falcon X65 cpu with 4 full Gig of Memory, 60 Gig SSD Hard Drive, 15" Touchscreen LCD with Integrated Credit Card Swipe, APG 16 " Cash Drawer, Star Micronics TSP-143 USB Thermal Receipt Printer, WHOZZ CALLING 2 Line ID (Must have Caller ID enabled on your phone lines), Epson TM-U220 10/100 Network Kitchen Printer, Windows Embedded POSReady 7 OS.Aldelo Professional 2013; Aldelo EDC Credit Card Software (included at No Charge when you sign up with choice from selection of Five Providers).